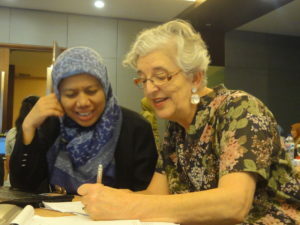 Supporting the development of the next generation of agricultural researchers is an important goal for the Crawford Fund and for this reason, we have supported training in a number of countries to assist early to mid-career researchers to improve their chances of having their research published in English language journals. Indonesia is developing significant scientific expertise, but for others to benefit from the science, and for the scientists’ own professional development, it is important that their work is published in English. In addition, a recent policy change in Indonesia requires PhD students to publish their findings in English to qualify for graduation. 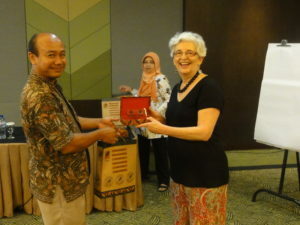 Most recently, the Fund supported a 5-day workshop for 23 members of the Biology Department at Institut Pertanian Bogor entitled ‘Upskilling Indonesian biology researchers for international publication: training staff at IPB to write and mentor students in writing’. 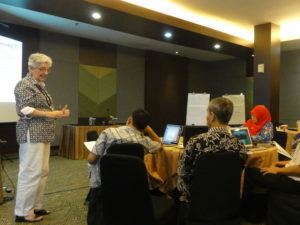 The workshop was led by Margaret Cargill and Patrick O’Connor (University of Adelaide), with Sukendra Mahalaya providing translation and facilitation support. During the workshop, the various parts of journal articles were examined in detail, including the title, keywords, abstract, introduction, method, results, discussion and conclusion. Overall editing procedures, as well as how to submit articles to journals with covering letters and respond to reviewer and editor comments were also addressed. After the workshop, participants reported greatly improved confidence in writing their own papers, dealing with the publication process and training their graduate students in writing. The training method used in the workshop is detailed in the workshop textbook, ‘Writing scientific research articles: Strategy and steps’ (2013, Wiley-Blackwell, www.writeresearch.com.au). The text addresses strategies for meeting the expectations of journal editors and referees, with guidance on how to develop appropriate skills in English that are relevant to a researcher’s own scientific discipline. It is hoped that it can be applied in other institutions facing the challenge of publishing scientific results in English.